Last night, we declared that the first person to solve The Case of the Creamy Foam would win a fabulous Marie Antoinette action figure (with ejector head!) or the fabulous prize that was hidden in a shoebox or the fabulous prize that was hidden behind the recliner or fabulous kisses from me. The "kisses from me" thing was an impromptu offering that I blurted out accidentally because I had Prince Harry on my mind. 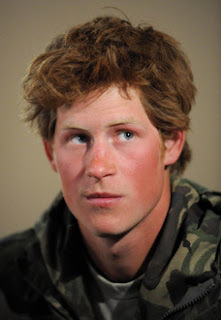 I mean, when bloggers post shirtless pictures of Prince Harry in military fatigues, how am I supposed to think about anything else for two weeks? While a guy on the couch took home the action figure, a girl in the front row was deemed runner-up. When people started shouting for her to choose kisses as her prize, I felt like I had just been transported into a horror movie. I sprayed my mouth five times with my Listerine PocketMist and moistened my lips with Burt's Bees chap stick just in case. Fortunately, there is a god, and the girl chose the trilogy of Whitley Strieber's nonfiction alien abduction books. It was only appropriate, then, that Brandon's friend Lily joined him on stage for "Sleep of the Just," a song she performed in the musical, Young Zombies in Love, many years ago. Horror at a distance is okay with me. Just keep it out of my own life.